THE FLAG INSTITUTE www.flaginstitute.org claims to be the world's leading research and documentation centre for flags and flag information. The Institute is a large vexillological group. 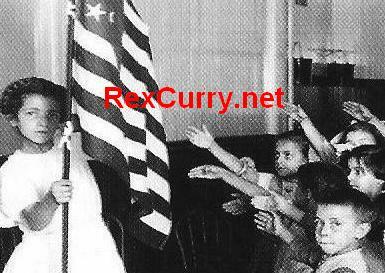 PLEDGING ALLEGIANCE & ADOLF HITLER, Youth's Companion, Francis Bellamy, Edward Bellamy, Hugh S. Johnson, Looking Backward, Pledge of Allegiance http://rexcurry.net/pledge-allegiance-pledge-allegiance.jpg Pledge of Allegiance exposed by Doctor Rex Curry. Hugh Johnson. support or citation (because there is none for you to provide) and it also indicates that you are unfamiliar with the information debunking your comments (you are unfamiliar with the opposing arguments because you do not actually address those arguments. Unless you are just turning a blind eye in order to evade those arguments). The German National Socialist salute was not derived from Italy. Your point would also fail in that even if it were correct, the Italian salute was derived from the American National Socialist salute, which predated the Italian practice. It is also interesting to note that at the time that Mussolini learned the salute, Mussolini was also a well-known and admired leader in the Socialist movement in Italy. The salute was not derived from any ancient Roman military salute, nor any Greek Olympic salute. Your comment in that regard is a startling cliche'. You should be ashamed of yourself. You provide support for Dr. Curry's work when you write "In the 1920's France issued a postage stamp commemorating the Olympic games. The stamp showed the Olympic stadium and an athlete wearing the laurel wreath of victory, with his arm outstretched in what was then termed the "Olympic salute". It also again shows that you are unfamiliar with the opposing evidence in that the information quoted from you is part of Dr. Rex Curry's work and supports Dr. Curry's work. The Olympic salute was derived from the American stiff-arm salute and the American salute predated 1920 by about three decades. One reason you are unfamiliar with all of the above is because the flag organizations you participate in are so intellectually dishonest that they do not even address these topics (and you have given them no thought either as you just repeat old myths without showing any hint of knowledge of the work that debunks them). above. And of course, attention will be called to the intellectual dishonesty shown by the lack of any comment on these historic issues on your web pages (including the lack of early photographs from the USA of the stiff-arm salute, and the lack of information on how the Bellamy salute utilized the military salute that then extended outward into a stiff arm salute, et cetera). P.S. the subject line of this email was "Pledge of Allegiance's salute is wrong. U.S. soldiers used stiff-arm salute before Nazis did." It is worth noting that you have not disputed the actual subject at all (and the accompanying letters is farther below and can be accessed by clicking here). That will be considered a concession by you in that regard (or is it just more intellectual dishonesty on your part, about another topic that is not addressed by you nor by the web sites of your organizations, and never will be?). Subject: Re: Pledge of Allegiance's salute is wrong. U.S. soldiers used stiff-arm salute before Nazis did. : Your assertion that the right-arm nazi salute was derived from American practice is incorrect. The nazi gesture was adopted following the style of the Italian fascists. That salute in turn was derived from the ancient Roman military salute, in itself taken from the Greek Olympic salute. : In the 1920's France issued a postage stamp commemorating the Olympic games. The stamp showed the Olympic stadium and an athlete wearing the laurel wreath of victory, with his arm outstretched in what was then termed the "Olympic salute". : Subsequent similarities in other countries do not mean that this ancient (though now discredited) gesture derived from those later forms. "Post hoc, ergo propter hoc" is no guarantee of the truth of an assertion. I suggest that the opposite contention is even wider of the mark. The original Pledge of Allegiance began with the classic military salute (to the forehead) that was then extended out toward the flag. It was the origin of the stiff-arm salute adopted later by the National Socialist German Workers Party, as shown by the historian Dr. Rex Curry (author of "Pledge of Allegiance Secrets"). It is frightening to note that Adolf Hitler and German National Socialists also adopted the gesture of the military salute from the chest extended outward to the stiff-arm salute. Research indicates that the current hand-cupping-the-breast is NOT the correct gesture, as originally intended, and that the chest-military-salute IS what was intended by people who supported the current "hand-over-the-heart" phrase. The same people who say that Bellamy would have opposed changes to the words of his Pledge, would agree that Bellamy would have opposed changes to the gesture of his Pledge. Some people thought it was creepy for children to perform the initial military salute to the forehead as written by Francis Bellamy in his original Pledge, so the forehead salute of the ritual was sometimes dropped entirely, leaving nothing but the American stiff-armed salute. 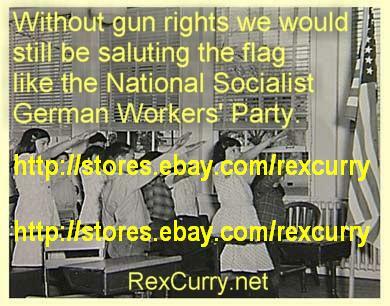 That modified form of the American salute was later adopted by the National Socialist German Workers' Party. Early flag ettiquette for men in uniform included the straight-arm salute when the flag was passing or when the Pledge of Allegiance was being mechanically chanted. 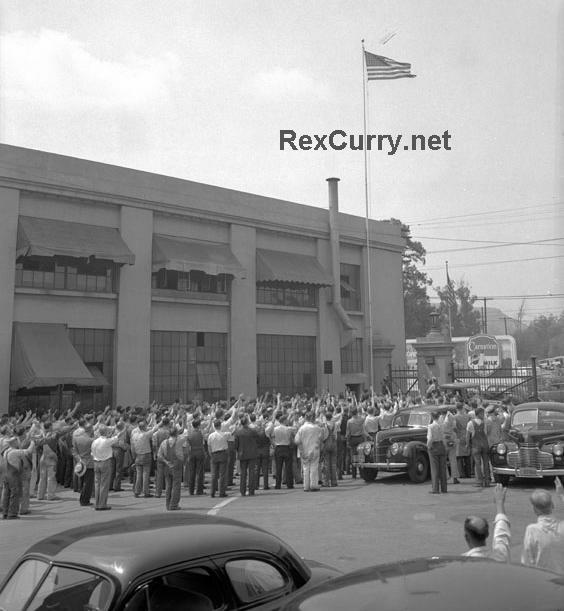 The Sunday Times-Signal in Zanesville, Ohio of August 9, 1942 states, "When the flag is passing in parade or in review, all persons present should face the flag, stand at attention and salute. Those present in uniform should render the right-hand salute." The same article distinguishes the behavior for the actual Pledge of Allegiance by stating that during the pledge, "Persons in uniform shall render the military salute." The newspaper provides a photograph of the right-hand salute showing a stiff arm salute with the palm up. The arm and the palm are so stiff and straight that, at a distance, the viewer would not see the direction of the palm. 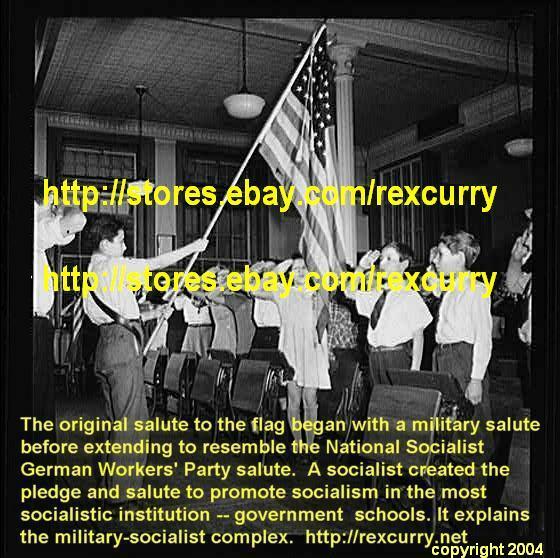 Old photographs collected by Dr. Curry show that the salute was also performed palm-down in the classic stylized salute adopted later by German socialists. In that sense, the "Nazi salute" is actually the "American salute" based on its origin. As consequence, the USA set a bad example for a long time. The world observed the U.S. military personnel delivering the straight-arm salute to the flag before WWI, during WWI, after WWI, into WWII and for up to three decades before the existence of the National Socialist German Workers' Party. It continued into WWII and to 1942 (and beyond) when Congress began to promote the hand-over-the-heart gesture. They even put flags (and chanting to flags) in churches in another eerie parallel followed later by socialists in Germany. Those historical facts explain the enormous size and scope of government today, the USA's growing police state, and its aggressive military socialism. They are reasons for massive reductions in government, taxation, spending, debt, and socialism. Hugh S. Johnson (above). General Hugh Johnson, was head of the National Recovery Administration (NRA). He was an army officer and politician and loved the Bellamy dogma of military socialism and the military-socialist complex. Government creates socialist programs to coerce everyone (including industrial leaders) into submitting to socialism, and the NRA was another example of that modus operandi. Hugh Samuel Johnson (1882-1942) enjoyed the salute and performed it a lot, even when other people were becoming even more uncomfortable about it. According to Time Magazine (9-25-1933), Johnson as head of the NRA (the National Recovery Administration, FDR's socialist program) used the salute to review a parade over which General Johnson presided. Hitler as head of the NSGWP (National Socialist German Workers' Party) used the salute to review parades. Those other uses increased through the efforts of Americans such as Ernst Hanfstaengl and through organizations such as the German American Bund (The Bund began as the Friends of New Germany in Chicago in 1933. The group traced its roots to the Teutonia Society and National Socialist Party, both active in the USA during the 1920s). Roosevelt also attended Harvard and knew Hanfstaengl. 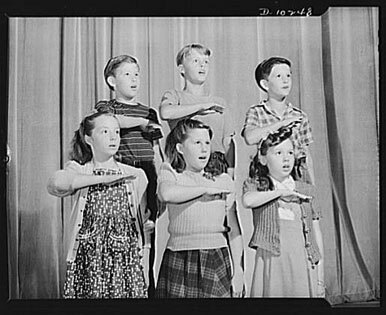 The leader of America's national government, Franklin Delano Roosevelt, learned the salute while growing up, and the salute was still being performed while Roosevelt was in office as an adult. Congress did not attempt to change the salute until after the United States was in WWII. Franklin Delano Roosevelt received the USA's Nazi-style salutes while he held office. The American salute was used outside the confines of the Pledge of Allegiance and the flag. 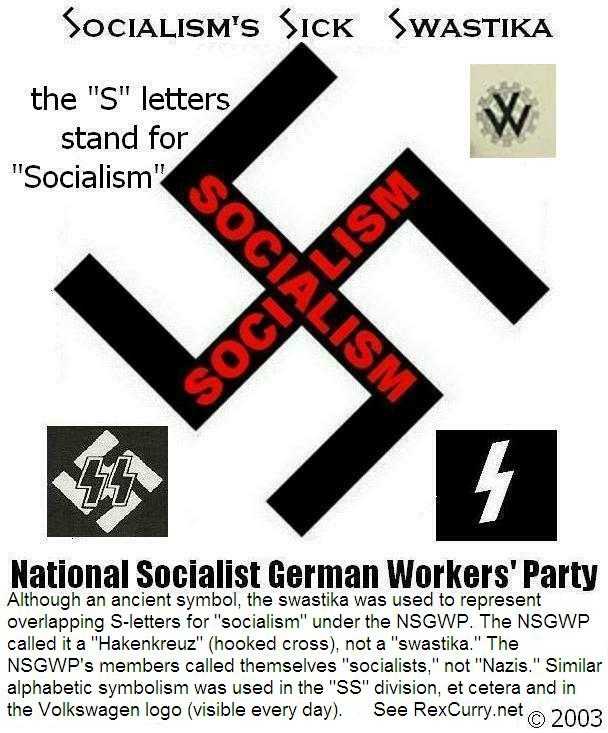 In other words it acquired other uses, another ominous parallel with what developed under the National Socialist German Workers' Party. 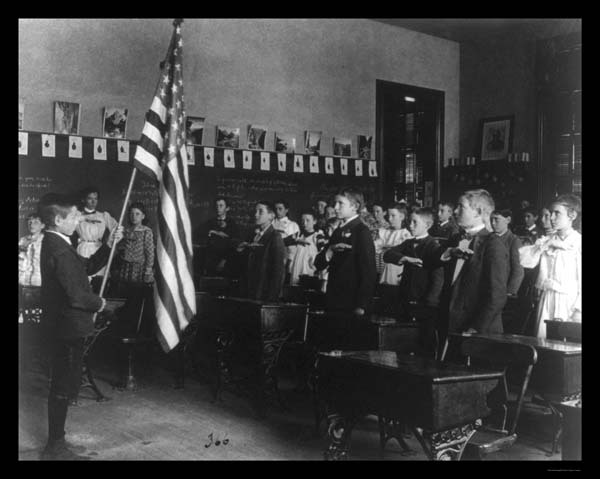 Like a cancer, the flag ritual of government schools in the United States spread domestically and internationally. "I was fascinated to see the pictures of US school kids saluting the flag, as they do seem to have an uncanny resemblence to images from the period of the National Socialist German Workers' Party. In this respect they are similar to images you explained from the 20's and 30's of people giving the 'Olympic' salute which was identical to the National Socialist German Workers' Party. This salute was given not only at the Olympics but at all sorts of other sporting events. I've seen pictures in the local papers for Northamptonshire from the 1930s of English school children giving the salute as they march past!" - Philip C.
The memoirs of Ludwig von Mises, written from his exile in Geneva in 1940, contain this moving, even tragic, passage: "Occasionally I entertained the hope that my writings would bear practical fruit and show the way for policy. Constantly I have been looking for evidence of a change in ideology. But...I have come to realize that my theories explain the degeneration of a great civilization; they do not prevent it. I set out to be a reformer, but only became the historian of decline." See "Ludwig Von Mises Notes and Recollections" by Ludwig Von Mises and Hans F. Sennholz; also see the article "Memories of Ludwig von Mises" by Hans F. Sennholz. This is the American salute by employees of the Los Angeles Department of Water and Power at Ducommon Yards in October, 1930. The flag was raised over the agency. 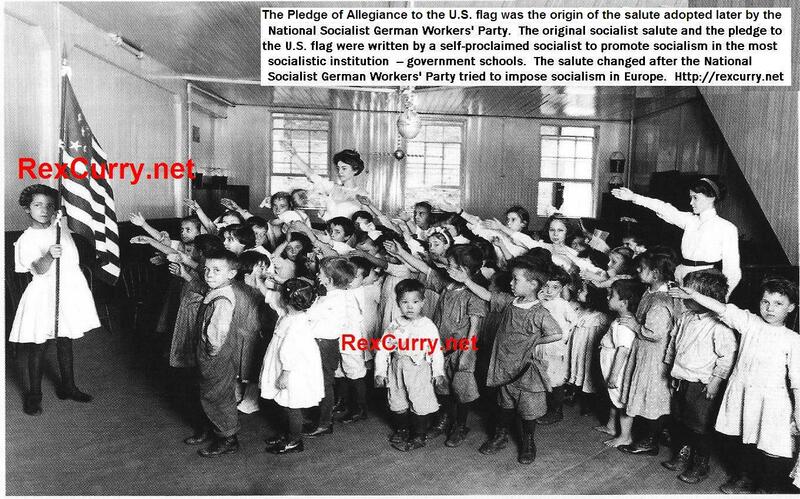 It is another example of how the American salute was spreading outside of laws forcing children to chant it in government schools (socialist schools). The German-American Bund, a supporter German Socialism and of the National Socialist German Workers' Party, was popular in southern California. At that time, no one knew how the War would go in regard to the USA. Today, adults do not want loudspeakers interrupting them every morning to command their mechanical chanting ala "1984"! Nevertheless, adults allow their children to be so abused in government schools where parents surrender their children. Adults also submit on occasion to the mechanical chanting due to peer pressure. From FrontPage Magazine: "Teachers openly oppose reciting the Pledge," according to Ari Kaufman. The same article indicates that Mr. Kaufman taught in government schools (socialist schools) from 2001-2005 (in Los Angeles). "Better to be silent and thought a fool than to robotically chant the Pledge and remove all doubt." Pledge Allegiance to the right to keep and bear arms. It still is a better idea for a salute. "Professor Rex Curry's work shows everyone an unintended consequence in the Pledge: It is a scary reminder of value in the Bill Of Rights - especially the Second Amendment."